These easy to do crafts and activities are super fun, stimulate toddlers’ senses, and promotes using fine motor skills! Happy Valentine’s Day! Take advantage of this fun holiday with activities that engage kids’ senses and fine motor skills. Give your child’s favorite games a Valentine’s Day twist or try an entirely new activity. Either way, you can make this Valentine’s Day one to remember with these activities! Help improve your toddler’s sense of movement (vestibular) and body awareness (proprioception) by holding a Valentine’s Day Freeze Dance-Off. It’s something your whole family can do together and is a fun way to get your child moving. Pick you or your child’s three favorite love songs and start the music. Dance until you stop the music and yell “Freeze!”Whoever is moving when the music stops is out. Repeat until only one family member is left in the game. Remember, you might need to try this several times for your toddler to understand the rules, but once they do you might find they want to play freeze dance again and again. To play with babies, hold on to them for support and dance with them until the music stops. Talk them through the activity to improve language skills. Make bath time extra special on Valentine’s Day with a heart-themed bath. Play with shaving cream and use it to draw hearts and X’s and O’s on top of the water. You can also put shaving cream on the wall and let kids wipe it off with heart-shaped sponges. Help engage your child’s sense of touch by squeezing the heart-shaped sponge. 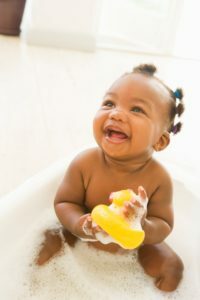 Talk to them about the texture of the sponge and other bath toys to improve communication skills. Your little one will appreciate this holiday surprise and spending special time with you. Baking is a great way to connect with your child. Baking – and eating – cookies is something the whole family can enjoy! Begin by finding your favorite sugar cookie recipe. Then, involve your child in the baking process. Use this time to teach them important routines, such as washing your hands before cooking. The older children are, the more tasks they can help with. Babies can watch you bake and listen to you explain what you’re doing step-by-step. Toddlers can pour ingredients (with help) and stir ingredients together. While mixing, allow children to feel the texture of the dough. You may choose to discuss how different ingredients, such as sugar or baking powder, form the dough’s texture. Involving kids in the baking experience this way engages their sense of smell, touch, and once cookies are ready to eat, taste. While cookies bake, prepare cookie decorations. Let your child be creative and pick the different colors of frosting or sprinkles that you’ll use. Remember, to discuss the decorating process with your child to promote language development. When cookies are done, enjoy!!!! Molding and playing with play dough helps children strengthen the muscles in their hands and improve their fine motor skills. You can let kids press heart-shaped cookie cutters into red, white, or pink play dough or use a toothpick or pencil to trace letters into the dough. Kids can also mold play dough into Valentine’s Day shapes. Start by turning one of the colors of play dough into a ball. Then, push the top of the ball down in the center to create an indentation to make the ball heart-shaped. Using a different play dough color, make X’s and O’s, phrases such as “Be Mine” or “Love,” or shape your child’s name. Place shapes or name on top of the heart to complete the project. Who doesn’t like a special card on Valentine’s Day, especially if it’s coming from a little one with tons of love to give? Instead of buying Valentine’s Day cards at the store, make cards with your child a few days in advance. You’ll need some blank sheets of paper that can be folded in half and crayons or markers to write with. Help improve your child’s fine motor skills by giving them heart-shaped stickers to peel off and place on cards or beads and small jewels that you can help them pick up and glue onto the card. Your child also gets to use their sense of touch each time they place a sticker or jewel on the card. Remember to keep a close eye on them since they could choke on small pieces. Children’s creativity can come alive as they design individual cards for their favorite people! Sensory jars are a great way to encourage sensory play and stimulate kid’s eyesight. The jars are easy to make and can take on any theme you imagine! To make a Valentine’s Day sensory jar, you’ll need glass jars with lids, liquid water colors, and craft supplies such as s glitter, bath salts, craft foam hearts, flowers or other items that can be put in water. Have kids open and close packaging and lids to improve fine motor coordination and strength. Let kids pick what they want to put in their jar – they’ll love making the decisions! In keeping with the Valentine’s Day theme, mix water and food coloring to make a bright pink or red color. Add the dyed water to the jar. Let your child get creative and pick what other supplies should fill the container. Stir everything together and let your child add glitter or beads to the jar as a finishing touch. Remember that children need supervision during all of these Valentine’s Day activities. With a little preparation and creativity you can make February 14 extra special for the little ones in your life! Want more ideas for kids to celebrate Valentine’s Day? 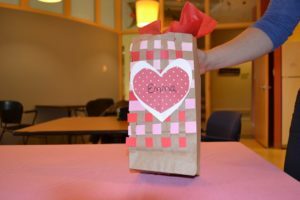 Great way for your child to recycle a paper bag & get in the Valentine’s Day spirit. This craft is a fun way to practice fine motor & organizing skills. 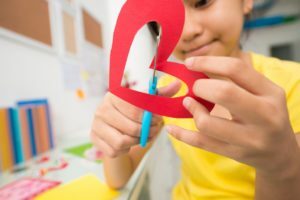 Fun Valentine’s Day ideas and activities for kids. These ideas will offer you child fun ways to explore their senses.